Tali is an NSF postdoctoral fellow in the Richards-Zawacki lab studying behavioral ecology, disease ecology, and eco-physiology. She is broadly interested in organism-environment interactions, and in understanding how animals respond to and cope with challenges in their environments. She is also fascinated by the ways that behavioral and physiological processes at the level of an individual organism can have impacts at the level of the population and community. Her dissertation work at the University of California, Berkeley explored the question of why we see such heterogeneous responses to environmental change, even among species that are closely related and share habitat. More specifically, Tali studied two California chipmunk species that have exhibited divergent range responses to the past century of climate change, exploring the roles that behavior and physiology may play in allowing these species to respond to and cope with climate change, and in shedding light on their interspecifically differing responses. 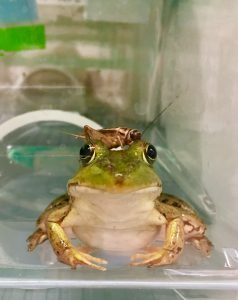 Tali’s current work in the Richards-Zawacki lab examines the sub-lethal impacts of the fungal disease chytridiomycosis on frog reproductive behavior and physiology, and the role that stress may play in mediating these interactions. 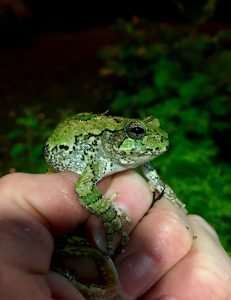 By focusing on a number of frog species in Pennsylvania, Tali will characterize these dynamics in organisms of differing disease susceptibility, taking an integrative ecological and evolutionary approach to this research topic. 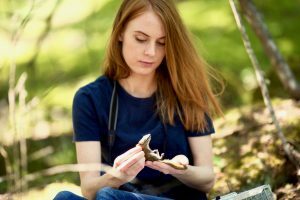 She is also working on validating a method to detect stress hormone levels in saliva from multiple species of Pennsylvania frogs. Tali is also interested in science outreach and communication, and is currently collaborating with the Carnegie Museum and the University of Pittsburgh’s Biological Sciences Outreach program to contribute to science outreach and education efforts in the community. When not sciencing, Tali enjoys art, music, and travelling to new places. You can find Tali’s CV and publication list on her website, and can follow Tali on Google Scholar or Twitter @mammalLady.